I’ve never been one for haunted houses. There’s something about paying money so I can saunter through a cobweb-filled building while actors in zombie makeup scare the crap out of me that just doesn’t tickle my fancy. Call me a bore, but I prefer to experience my ghostly encounters from the comfort of my couch, with a cup of tea and a cookie, through the pages of a favorite book. Here are five haunts I feel very comfortable visiting again and again…as long as they stay on the page, and as long as I don’t get trapped there for the night. 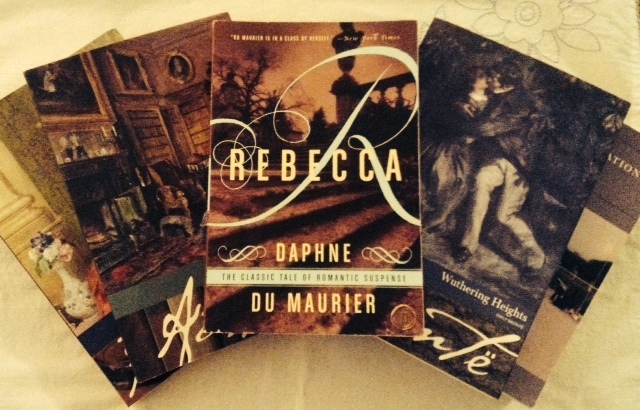 You know how Rebecca opens with the second Mrs. de Winter saying, “Last night I dreamt I went to Manderley again”? If I were her, I’d be like, “Last night I had a nightmare about that hellish place I can’t even mention and no amount of Lunesta is going to help me because all I can think about is that crazy Mrs. Danvers.” But I guess it’s all about perspective. Manderley may seem like a glorious English estate. They sell pictures of it on postcards. They hold super-awesome costume balls there. If you fall in love with a rich, handsome man on holiday and he wants to marry you and take you to live there with him, I can see where you might say yes. Even if his first wife died there in a mysterious “boating accident” the year before and everything in her room remains untouched, including her nightgown, lying waiting for her on the bed. And there’s also that creepy housekeeper, Mrs. Danvers, who keeps talking about how glorious Rebecca was while making you feel like the smallest person in the world. And you are NOT allowed to go in the boat house. Oh, and don’t forget about Ben, the guy who wanders around the beach and is terrified about something he saw and keeps swearing he won’t tell. I mean, I would probably be crying for an annulment by day two and would get as far away from Manderley as possible, but I suppose everyone is different. Maybe the Ghostbusters wouldn’t find anything supernatural here, but you can’t tell me this house isn’t haunted. There are iron bars on all of the windows. The whole place is dilapidated and falling to shambles. All of the clocks are stopped at twenty to nine, and there’s an abandoned and decaying brewery outside. The lady of the house hasn’t come out of her yellowing wedding dress for decades, nor has she put on that one shoe that’s been sitting on her dressing table all this time, and all she wants to do is manipulate children and cry about her broken heart. This place is filled with ghosts. You couldn’t get me within a three hundred-foot radius of it. There’s a reason why people don’t talk to their neighbors. Imagine you rent a quiet home on the moors for some rest and relaxation, and decide to pop next door to visit your landlord unannounced, only to find that he is kind of a scary guy and that he has two sullen young people living there who bark at you when you speak. None of them are welcoming. Would you run, or would you ask for a cup of tea and invite yourself to spend the night because it’s getting awfully stormy outside? Say you’re clueless and go with the latter, like our pal Mr. Lockwood. You settle into a bedroom and you find that someone has scratched her name into the walls—“Catherine Linton,” “Catherine Earnshaw,” and “Catherine Heathcliff.” Then you have a “dream” that this Catherine is trying to climb in the window, and your landlord runs in all freaked out and starts hanging out of the house crying, “Cathy!” I mean, you would definitely get out at that point, right? Too bad Mr. Lockwood didn’t have Trip Advisor at his fingertips when he was looking for a peaceful rental. Catherine Morland is someone any book-lover with an overactive imagination can relate to. She adores Gothic novels so much. She is completely smitten by the charming Henry Tilney. Of course she wants to go stay at his family’s house, and of course she’s going to suspect a thousand ghastly things when she finds that his dad is a mean old General, his mother died there, and there a bunch of rooms that are completely off limits. Is the house haunted? Maybe not, but try telling that to someone who can’t get her nose out of The Mysteries of Udolpho and she may not believe you. Many of us have had jobs that seemed less than ideal, but at least we’ve never had to work as a live-in governess in a house where there are screams and maniacal laughter coming from a closed-off quarter. And where the master’s bedroom is set on fire. And where a visitor gets mysteriously stabbed. And where a crazy lady shows up in people’s rooms and destroys their wedding veils. I mean, job security is one thing, but if I were Jane Eyre, I probably would have given my notice after the first sign of danger, no matter how much I loved teaching Adele. Oh, wait. Mr. Rochester lives there? I could make it work. Do you have a favorite literary haunt that didn’t make the list? Share your thoughts below!